It’s that time again….JULY! The world is celebrating watercolor, so you know I am too! On my posts on this blog and YT, they’ll be watercolor OR watercolor-adjacent; meaning some will be in watercolor, others might be coloring water in other mediums. So my copic and pencil peeps need not sign off for a month! On social, keep an eye out for the monthly challenge – which WILL be watercolor. I’m excited! When I saw this stamp set, it was made for someone like me, right? I had to buy it! And rather than stamping color names into the tubes, I instead made a spinner card out of it with a unique mechanism to get the right parts spinning. Watch the video below or click HERE to see it in HD on YouTube. 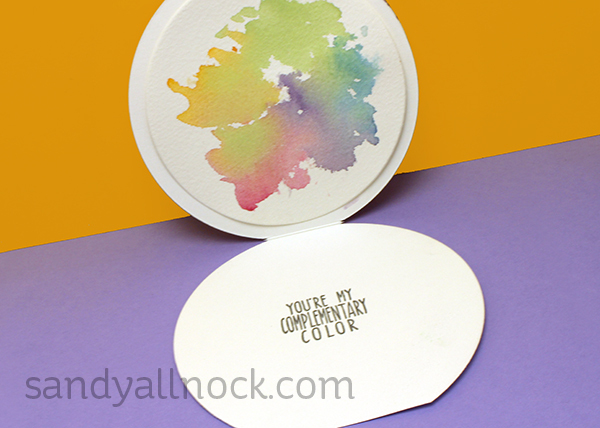 Even the inside has a splash of watercolor – a panel to cover the back of the brad! 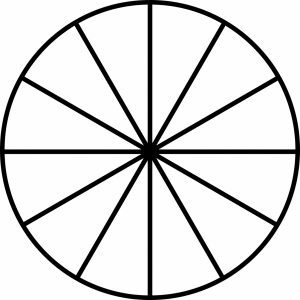 And if you’d like to color a wheel to use as a template, here’s a blank to use – resize it in Word or something based on the size you need, or just diecut after coloring it in. Oh wow, this is just so cool and fun!! 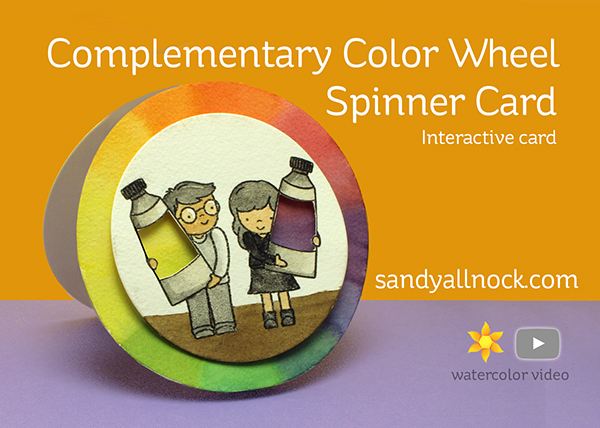 Sandy, I own no watercolors. What basic set, or colors, do I need to do this class? What a lovely card and funny idea! Thank you Sandy, I am so curious what else you are going to show us this World Watercolor Month. Awesome card, thanks for the video! Wow! Sandy, I LOVE this cool card! It’s so clever and fun! So clever. I think this is the coolest idea.